It's a brand new year and a brand new Hodgepodge! I will have accomplished that...only with the Lord's help. 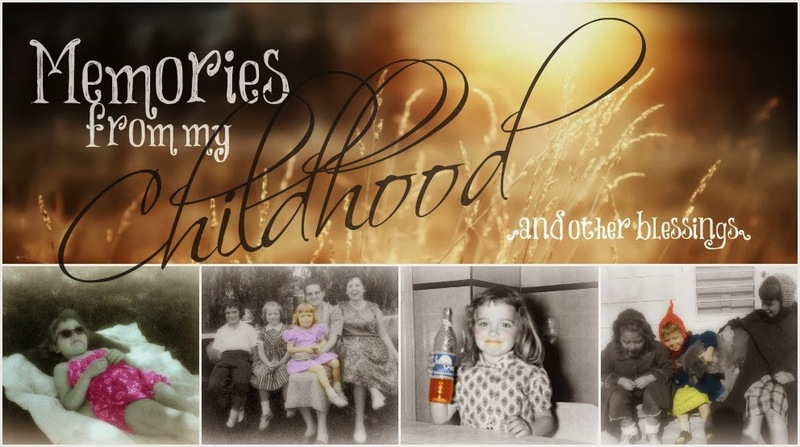 ...where Joyce asks the questions and we answer them on our blogs. Oh my, there are so many to choose from...some I've not really paid much attention to and others that are just plain silly. Of all that are on this list, I'd like to see "fake news" disappear...and not just the term...but the real thing, which sounds like an oxymoron. Remember the days when we used to be able to trust what we heard on the news and respect the people who brought it? I hope that day will return soon. Right now I can't think of another word to add to the list, although there surely must be more floating around out there. Worrying too much. I know better. ...and this was Brunswick Stew! and that the next 362 are even better! Oh I do hope you get to fulfil your dreams and manage to move to the Country. You know I'm teasing you because I love you...don't you? HUGS!!! Your stew looks so tasty! 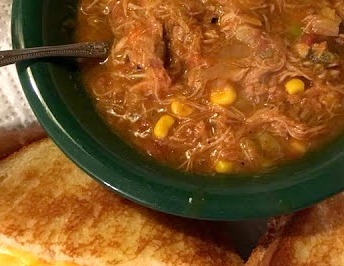 I did not know what Brunswick Stew was until I moved to Georgia, now I'm a huge fan! Wish I had some right now, it's so cold here in the mountains. I like mine a little more chunky, less stringy too. That one looks good! It's definitely soup/stew weather around here. Happy New Year! I'm sure I've had Brunswick stew -- or a form of it, but where we live is not very southern--there are so many transplanted northerners (I'm one) to dilute the southern culture. But it looks hearty and perfect for cold day. We are soup lovers to an extreme. It's a tradition in our family--even extended family--to have a soup party over the holidays where there can be 10 different kinds of soup, along with recipes. Yum! One word that I would like to see or hear less is 'unthaw' If it's unthawed that means its frozen.Hope your new year is off to a great start. 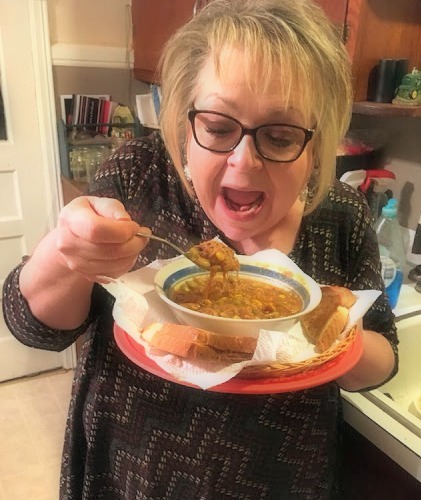 Oh Debbie, when I lived in Virginia I was introduced to Brunswick Stew and I could not stand the consistency either. Ugh!!!! But, give me some Beef Stew and I'm a happy gal! Sounds like an exciting year ahead for you. Hugs! Born in Virginia, but have lived in the North for the vast majority of my life. I really like Brunswick stew and I have texture issues. I must have found the real McCoy. I am all for calling out fake news, but like you, I’d like “real” fake news to go away. I have been reading what Presidents Washington and Jefferson had to say about the press. I think fake news has been around a long time. Everything is going to go very well with your move to the country. I love the sign at the end also ... not random at all, but completely true and entirely relevant. And we have stew, soup, and chowder several times a week in cold weather. We just don't tire of it. Aaron's Brunswick Stew looks very good. Like you, I worry - a lot, even though I know it doesn't get me anywhere, as the saying so wisely declares, apart from running around in circles, which can be exhausting! 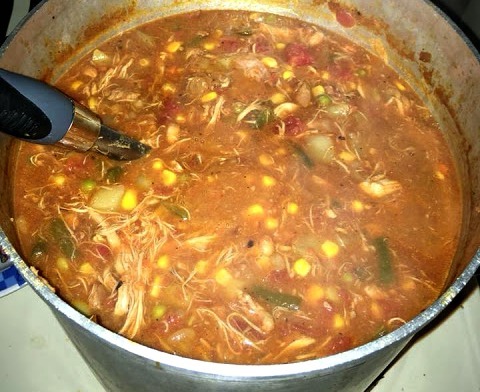 Your Brunswick stew looks and sounds scrumptious, and I agree with you, recognizing meat and veggies would make it more appetizing. Wishing you all the very best in health and happiness for 2018! I so agree with that much over-used "fake news," but would also have to add "tweeting, tweet, and the act of tweeting." That is definitely over-used...both the word and the act of doing it. Now you have me thinking about homemade soup! Well, so much of your podge resonates with me! Nodding my head as I read. Looks like we'll both become country mouses. May God make our transitions good and bless our new homes. That Stew looks duhlicious!! Oh, wow, that Brunswick Stew looked YUMMY! I haven't had that in a while...it made me crave some. :) I am so thankful you had a great time with your loved ones, sweet friend. 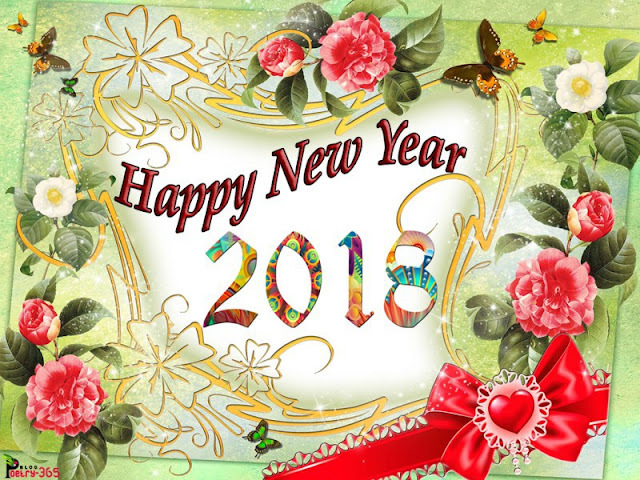 Happy, happy new year to you and yours! The thought that you ended with is so true. Onward into 2018 . . . with the Author! Brunswick stew is a new one to me! I enjoyed reading this...I am behind. I think I missed your last one. Sometimes it is hard to focus when I finally sit down to blog. But I always enjoy reading. I am going to have to look up the stew....see whether I think I will like it or not. You make me giggle, Debby! I love bopping over and checking out your posts. I haven't been by in awhile. So this was a nice little visit. Ya, we needn't worry, especially since God's got our back! That stew looks delicious! I'll have to google the recipe. Dear Fellow Worrier, I also know better! 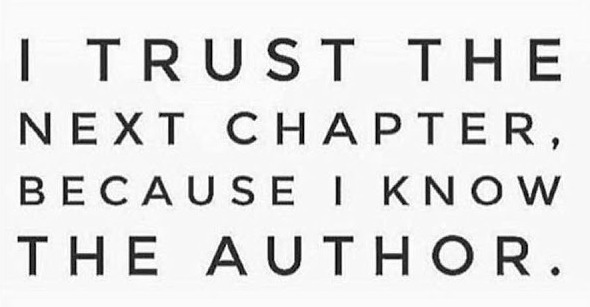 But I'm hoping that this is the year to get better at trust, and let it all fall into the lap of the Lord. I would love to see the word 'unpack' be banished. Hugely overused, and I'm done already!